Some tools are developed as a solution to a certain issue and even after updates, revamping, and some necessary adjustments they consequently provide the same solution as elaborated in the first place. And then there is SaaS Manager – the opus magnum of Neoteric, one of our startup “children”. SaaS Manager saw the daylight in 2010 as a platform for developers working on launching their startups. We already learned our lesson on launching startups the hard way and wanted to present the world an option on how to make it in an easier, less painful way. Not to mention – a significantly shorter way, as SaaS Manager enabled speeding up the software launching time by up to 3 months! The platform provided functionalities crucial for creating a SaaS application: authorizations, SSO, customer management, notifications, payments, subscriptions. SaaS Manager was designed as a complete launching solution and a project life-saver. 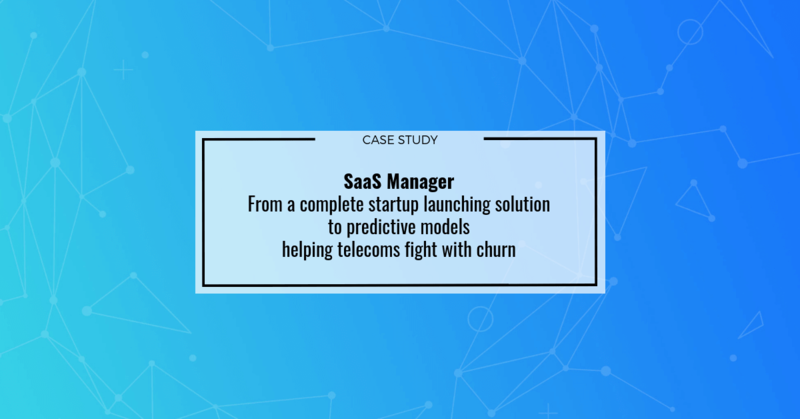 Eventually, SaaS Manager turned out to be the perfect solution for the telecoms struggling with churn and customer retention. What primarily served the role of a software-launching enhancer, underwent a complete substantive makeover and started its journey in a new role. The cloud-based platform was rebuilt with a view to serve churn reduction and offer optimization. Crucial components were built using Java, NodeJS, Angular, and NestJS. Thanks to the usage of Azure, AWS, and client sided services, the project works in a hybrid cloud. The project transformation also included switching from waterfall development to agile manufacturing. Our development team decided on implementing automation solutions provided by G1ANT and Puppeteer in order to ensure highly efficient task completion. Due to implementing artificial intelligence and machine learning, the platform surveys customer behavior and provides predictive behavior models. SaaS Manager holds a particular place in Neoteric, as it is the oldest “child” and brought along several lessons. This project managed to sign a funding agreement during the InfoShare Startup Contest – as a first-ever Polish company managed to do so before the end of the conference. Obtaining $250.000 from the FerberVC followed a previous success – the main prize during the AmberHub Startup Contest. At the beginning of 2018, enterprise license was bought by one of the major Polish telecoms. Currently, SaaS Manager is a versatile tool remembering its roots but serving mostly the new purpose: helping telecoms predict churn and customer retention, prepare personalized offers, as well as improve revenue and margins.